Statoil and partner ExxonMobil confirm that the Zafarani-1 well in Block 2 offshore Tanzania has encountered indications of natural gas in a good quality reservoir. Drilling operations are still on-going and it is too early to give any indication of size and commerciality. The well was spudded in early January 2012 and drilling operations are expected to take up to a total of 3 months to complete. 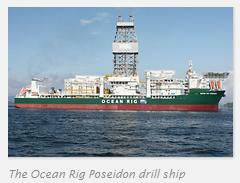 The well is being drilled by the drill ship Ocean Rig Poseidon and is located some 80 kms off mainland Tanzania. It is the first exploration well that has been drilled in the licence which covers an area of approx. 5,500 sq kms. The water depth at the well location is 2,582 meters and the well itself is planned to reach a total depth of 5,150 meters. Statoil operates the licence on Block 2 on behalf of Tanzania Petroleum Development Corporation (TPDC) and has a 65% working interest with ExxonMobil Exploration and Production Tanzania holding the remaining 35%. 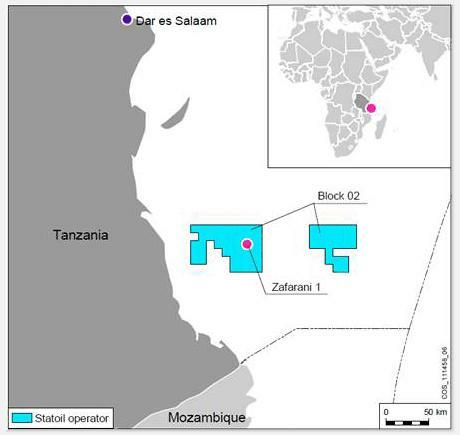 Statoil has been in Tanzania since 2007 when it was awarded the licence for Block 2. 'TPDC is pleased about these preliminary results and is eagerly awaiting further information on this operation,' says Yona Killaghane, Managing Director of TPDC. The final assessment of what has been encountered will be released at a later stage once drilling operations have been completed and the well results fully analysed.